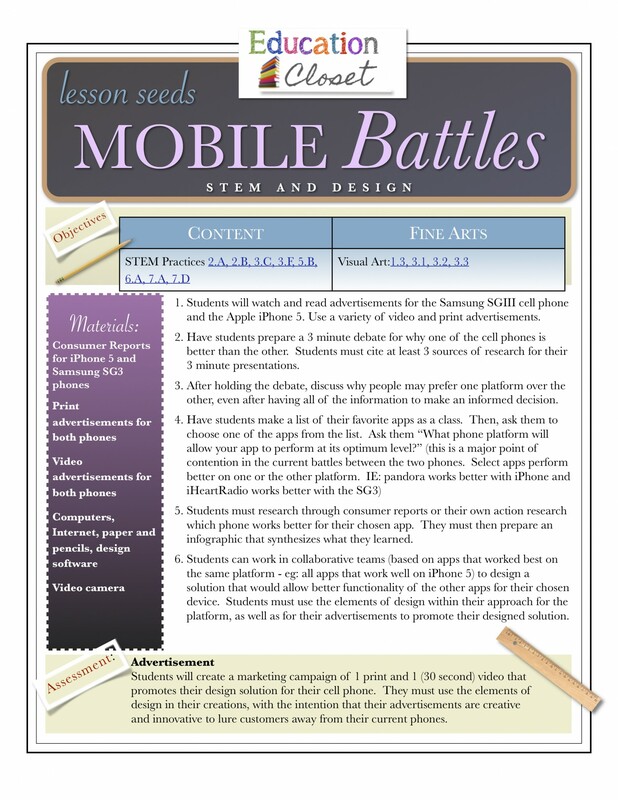 To conclude our week of highlighting STEM and STEAM, today’s free Friday is a STEAM lesson seed that focuses on one of the hottest topics to our students (and let’s face it…ourselves): which cell phone is better? The iPhone 5 or the Samsung SGIII? Using this topic, we ask students why certain apps work better on one of these phones over the other? Their task: to design a platform for their chosen phone that will allow all apps to function optimally. Additionally, they must design and create an advertising campaign using the elements of design to communicate their message effectively and lure customers to switch to their phone. Designed for students in Grades 7-12, this lesson is an exciting way to integrate across all disciplines. Happy Friday!